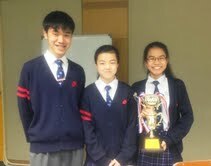 Thomas Chung from PLK Laws Foundation College I opens his team's case in a Round 1 debate against. Paul's Convent School seniors on the motion that large social media companies make unfair use of users' personal information. Tuen Mun Government's Kristy Leung gives a strong second speaker delivery for her team at the Grand Final Debate. 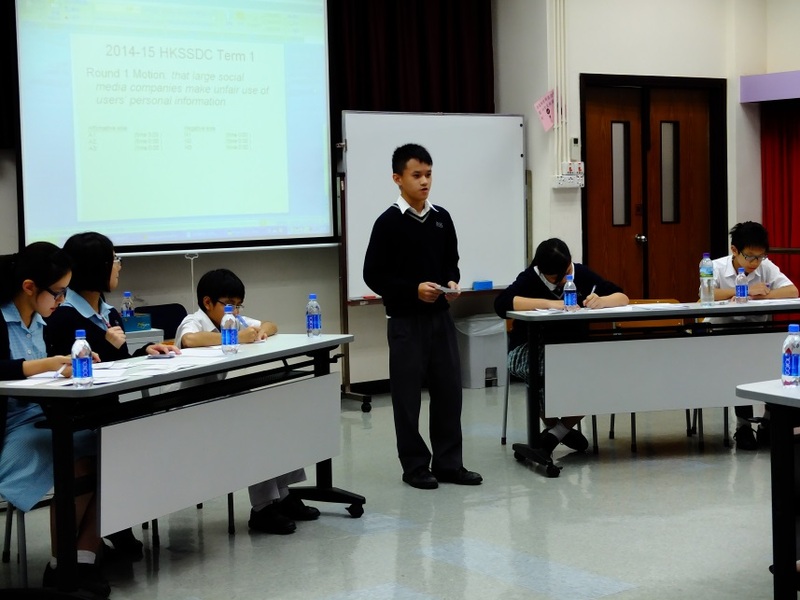 All eyes and ears on the adjudicator: SKH Chan Young Secondary School and Kwun Tong Maryknoll College debaters listening carefully to comments at a recent final. Kau Yan College's third speaker Mika Mang shows her experience as she convincingly delivers some well-targetted rebuttals and a very tidy team summary in a Term 1 finals debate. STFA Yung Yau College's second speaker, Sally Yip continues their team's smooth, persuasive delivery in a Term 1 New Territories final. 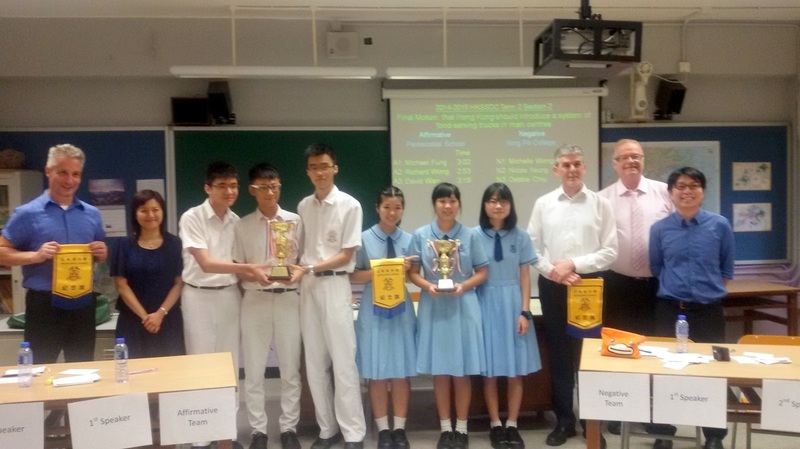 Buddhist Sin Tak Secondary School's Junior Team (from L to R) Lam Wan So, Cheryl (2B), Tse Ying Hong, Carmen (3D), Macy Young, Jessica (2B), Li Chun Hung, Alex (3A) and Wong Yuen Kei, Tom (3D) proudly showing their 1st Runner-up trophy from the New Territories Junior Finals of the 2013-14 Term 1 Competition. Cheryl was also named “Best Debater” in that debate. This is how we've got to say it! The YMCAHKCC Senior Team decides on their next rebuttal.